Airplanes entered Fortnite with Season 7, but are dragons arriving in Season 8? Some Fortnite players have been using glitches to get under the map for quite some time, however one person was able to potentially unmask a secret from Epic. 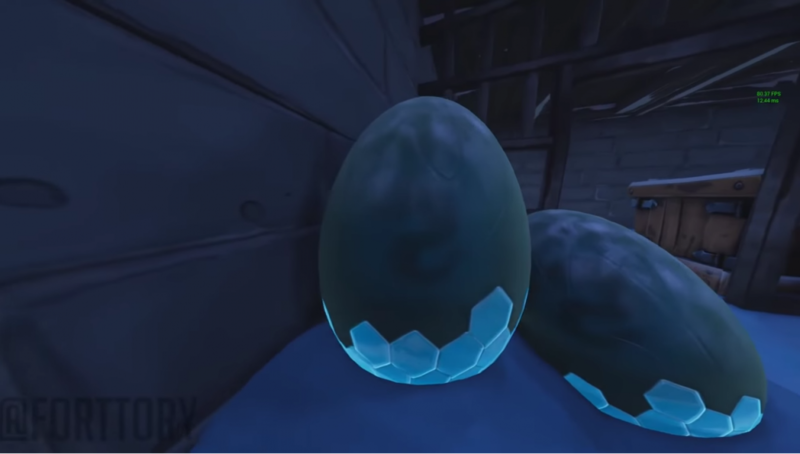 Fortnite leaker FortTory was able to go under the map in Fortnite and was able to see five mysterious eggs inside a prison cell in Polar Peaks. The leaker was able to publish his video on Youtube. The eggs have an icy-scale texture on the bottom, while the actual egg portion casts a silhouette of an infant-like creature. FortTory speculates that the shadows could potentially be baby dragons waiting to hatch. The leaker was also able to find a sound file within the v7.10 update of a heartbeat. It is almost certain that the dragon eggs will appear in Fortnite, but nobody knows when. Dotesports speculates that when more ice melts around Polar Peak, the dragon eggs may hatch and “wreak havoc” on the Fortnite island. Another possibility is that the dragons will hatch, and then they could act as a friendly mount for players to interact with. With the addition of airplanes in Season 7, they might be acting as an introduction to other means of arial transportation. Nothing is confirmed except for the existence of the mysterious eggs, and all we can do is wait to see what Epic has up their sleeves.